An old map is housed under glass: an ink land. The territory was traveled once and declared known by the walkers. In the western corner is the face of an old man with puffed cheeks as he forms herds of clouds, a gentle representation of a ferocious force: wind. Wind. Expelled from the mouths of wolves to eat some pigs. Wind shakes the windows and blows the leaves from the trees. Every year, with invisible hands, the wind disassembles. 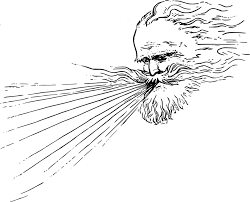 New York City is a rugged place where people learn the locations of the strong wind tunnels like one thousand small rivers across the five: down 5th Avenue and Lexington. Wind carries the trash in giant murmurs along Flushing Avenue and Broadway in Bushwick. You haven’t felt the wind until you’ve felt it in New York City, without cover, without solace, as you hopscotch through the streets, dodging objects as they fly past like a video game. I bore the wind once with my best friend. It was hurricane Irene no less, a gentle storm compared to the year following where we were fed a taste of apocalypse just before Halloween night. This was before we knew our direction, before we dove into our lives, and we were youthful observers, trying to bend the rules, trying to deal with freedom. She has since married and lives in a residential neighborhood, with nice brownstones. But this was during the wander years and we would take vast treks to men’s apartments who we thought might be suitable. We liked to feel them next to us, to let our bodies go for a moment and let them press themselves against us. Hurricane Irene was one of those nights. At least for her. I’m a best friend kind of lover (thank you nytimes) and let people come out like characters in pop up books. No interview or vetting process. I believe in magic when it comes to romance. So I was her wingwoman in the hurricane as we braved across town to her brother’s loft where some guy had said he might show up to meet her. At the apartment during the hurricane I was concerned with a certain tower that was being erected with matches and lighters and beer cans and books (college residue) as, in boredom, we constructed small cities because we couldn't go outside on account of the rain. The purple swelling of streetlights overtook the night as the sun went down. The winds started up and this young man had not turned up with his crew. Because he did run with a crew, and here’s to him for having so many friends at the same time. Wind generates primarily in the west. Except for the winds that come up from the south. These are tropical and vicious. On this side of the world, the northeasterly part of North America, doors are traditionally built facing the east to protect the house (or, originally, it was tipi or lodge, from the westerly wind.) Now, I’m certain it’s difficult to know directions, even though, I would say New Yorkers can orient themselves pretty well based on the grid. The night became punctuated with cigarette breaks and moments where the music was too loud to talk. Everyone in the building was partying because no one was older than 28. We decided that maybe we would go to the bar anyway. In ancient Indian and southeast asian Auyervedic tradition, Vata represents the wind and space element within the body. Motions and initiations are both the operators within this element. When Vata is healthy there is a great amount of creativity, athleticism, and energy flowing from the individual. A Vata instability can lend to anxiety, hypertension, and restlessness. This Auyervedic system is similar to the humors of the medieval ages. Each function of the body represents a different element. It is ideal for these elements to be balanced for ultimate bodily functioning. While each person has a primary element that works within him or her, the rest must work in conjunction with it. I believe we are living under the God of Vata, no matter our general constitution, Vata is imbalanced within us. We are the Vata generation, we are off the ground, in space, obsessed with creation from minute to minute. To not create, or speak, is to not exist within the confines of society. To not have prospects walking stridently over the horizon is to not function. We are restless and listless at once. A bar is a plausible place to experience the greatest storm in New York City history, or so we decided. The neon sign read ‘whiskey town,’ in scarlet. The TV was on. The announcer poured over the storm. People were out making live video in Brooklyn, in Bay Ridge, on Long Island. A familiar face strode by with heavy dark hair and then was gone, a lover I once had. A lifetime ago. My friend’s crush came, held her hand with cold jittery hands and left. We walked home against the wind. On the news they studied the map of the region from North Carolina to Vermont. It was a mess of color, no lines drawn out, no barriers, a jumble of wind and clouds that covered the land. Trash collects like a wreath around a homeless man at 116th street. “It’s wind.” My colleague says. “It’s wind.” I echo, as if it was my idea. Trying to grasp at something solid. I’ve been flying for years.